found..Collon Animal Sanctuary . 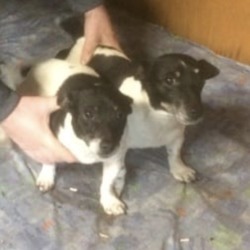 **FOUND** PLEASE SHARE** Two female terriers, believed to be both adults, found in Wilkinstown area in Meath. One seems to be younger and was wearing a collar, but no tag or identification. In care of finder. If you think you may know who owns these or if they belong to you and are missing, please contact the finder on 0879848074. Proof of ownership will be needed.